"I want to say again how good it has been to work with COOL AWNINGS, everyone involved has been pleasant and helpful not to mention patient. The job with Resolution dragged out so much longer than expected." 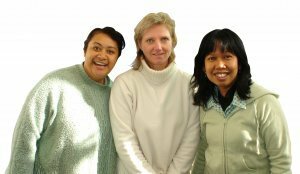 "On behalf of the Aoga a le Teuila Preschool, I would like to thank all the staff, especially Daniel who installed the shade sails for the professional and friendly service." "Once again you have done a marvellous job on our awnings. My wife and I would like to thank all the staff from those who answer the phone and those who organise the making of the awning you have all been terrific. "Paul and I would like to thank you all for our beautiful "Pebble Stone Blinds" Not only do they look good, they have been made well too. We also want to thank the installation guys who took great care in putting them up and making sure everything was in line and working. How nice it is to see a company take so much care and pride in their work, so thanks again!" "Thank you so much for the excellent service your team have provided. Your staff always exceed our expectations!!! We will have no hesitation in recommending your company to our friends and family. (...I already have) All the very best for the future." "We recently had an awning installed over the front door of 2 properties. Both look fantastic. The service right from our initial enquiry to the installation was first rate. We would definitely recommend the Team at Cool Awnings." "What a pleasant experience we have just had having 5 relatively large mesh blinds installed on our new deck. Not only do they look good, they have been made very well to. No hitches and ready on time. The staff are all so helpful and friendly. The installation team took great care and pride in making sure everything was lined up and working just fine. So nice to see this in a company. Thank you to all. I highly recommend CoolAwnings and would not hesitate in using them again." "A seamless project from start to finish. I visited the showroom and was shown the options. Then the installation happened when they said it would and the followup was professional with cleaning suggestions. The person who fitted them was very very good. A friendly and successful experience." "Everyone from sales, install and electrical works who was involved with the installation of our awnings, arrived on time, were friendly and thoroughly professional. Would highly recommend." 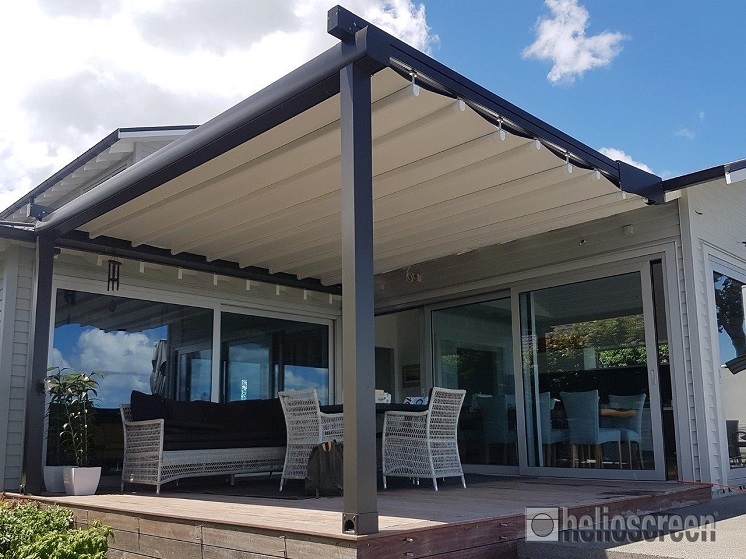 "We are thrilled with the PVC drop curtains on our back verandah. It makes a wonderful conservatory that can be rolled up when we don't want to use it. Love it!" "I thought I'd drop a line to say how pleased we are with our lovely "easy- shade". We have been able to sit outside and enjoy the outdoor life in our "little backyard", finally!!!! Your blind/shade meets all our requirements a far as protection goes from the afternoon sun. We were very pleased with the fast response to our enquiries and also to the fitting of the ''easy-shade". Your team was reliable and very professional in all aspects of the transaction. We are very happy customers and we thank you. Cheers." "Excellent Company and people to do business with. They were recommended to us and we couldnt fault their service and quality. The job was ex factory but they were in our area and delivered the awnings personally. " "This is the second time I have used Cool Awnings and I was very happy with their work. Their quote wasn\'t the cheapest but one part of the order was for something a bit unusual and I felt more confident in their approach than the other company who quoted and who I had also used before. They would be my first choice if I needed anything similar in the future." "Excellent customer service and professional job, good communication, attention to detail and followup. Very friendly and obliging team. We are very happy with result and recommend this business"
"I have been meaning to touch base to let you all know what a great experience we have had from Cool Awnings from the very beginning when John came for the initial visit, right up to sitting the alfresco area admiring it all. The area has always been great, but given we are on top of a hill in rural Waitakere, we couldn’t always use it. Now we are very happy to say that except for a rare northerly, we use it all the time! All the staff we came into contact with were excellent – thank you all very much, and credit to you for co-ordinating such a high standard of customer service." 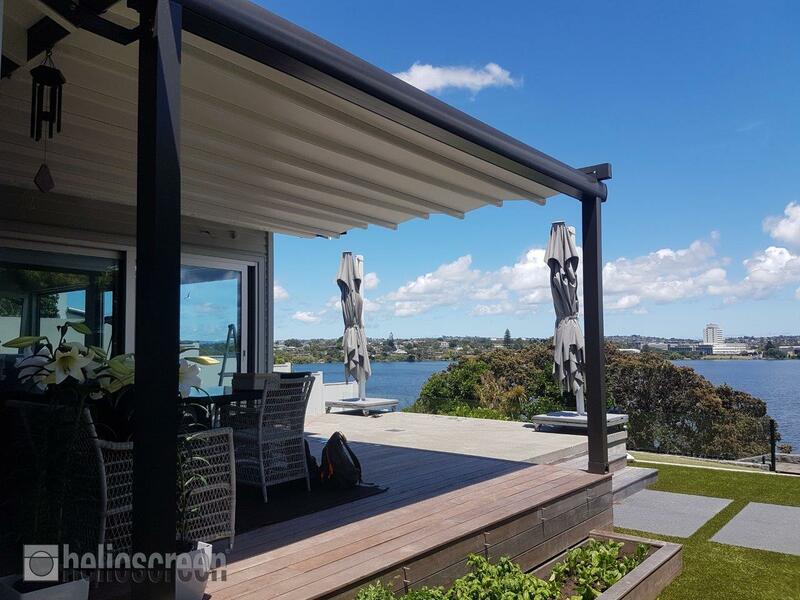 We at Summerset use Cool awnings for all our requirements regarding Awnings, we find them to be very quick at getting out to us for quotes and their workmanship is exceptional. Thank you cool awnings. "We are thrilled with our Swingline awning purchased and installed by Cool Awnings in March 2014 and have no hesitation in recommending this company. We were very impressed with the service we received - John did not hesitate to return to re-measure when we were deliberating over the size of the awning we wanted, the installer made a pre-manufacture site check to ensure the awning could be (structurally) installed where we had requested (this gave us great confidence) and the office staff we dealt with were friendly and helpful. Our awning was made well within the given time frames and we think price-wise this company offers great value for money. " "Cool Awnings installed an awning for me. The service and care they showed me was amazing and when the awning was installed it exceeded my expectations. They are undoubtedly a business that cares for customer satisfaction a rarity today. Thank you Kylie and John." "We purchased a lateral arm awning from Cool Awnings. John looked after us very well and coped with our tricky requirements. The team was friendly and helpful, and worked well with my builder as I requested. We are happy with the awning and can recommend this business"
"Very professional company to deal with especially as we had no in depth knowledge but knew we wanted a first rate job done and within a tight timeframe. Their adviser Walter appeared at the property the same day that I phoned to make the initial enquiry. A quotation followed overnight. The job was done and effected within the desired timeframe and at all points of contact the CoolAwnings people were courteous and efficient. They know the business they are about very well and I would have no…"
"Generally found working with Cool Awnings a pleasant experience to produce the ideal out door setting that we were endeavouring to create for our staff." "We are very happy with the double glazing provided by installing Magic Seal Secondary Glazing." "Just wanted to say what a pleasure it was dealing with you guys. Unfortunately it's not so common to get good service all round, and I was so impressed with how you were always right on time with appointment times, with having the job done in the time frame you quoted, and how simple you made the whole process - and most of all, the product looks great. Thanks so much again, and we'll be in touch"
"Just a quick to note to say that we are very thrilled with our beautiful new awning – and for the free calculator which you sent us with your follow up letter. Many thanks to all the staff at Cool Awnings and especially the lady on the front desk who helped us decide and on arranging everything for us so promptly, and to the 2 men who did all the hard work and such a thorough job! Thanks again!" "Some years ago, Cool Awnings designed a metal hood, European café style to go over our front door with copper sheathing. It’s had many admiring comments such as - where did you get this made? Recently we went back to Cool Awnings to get a retractable shade made for another situation. From start to finish, the job was ordered, measured and installed within 10 days. Great work Cool Awnings." "Very professional and great to work with. No problems at all and thoroughly recommended. Installation team very punctual and professional in every respect. Highly recommended and I would not hesitate to use them again. Many thanks." "Fantastic service and communication from first visit to showroom to first site visit for quote then installation and follow up. If you want friendly, excellent service, don't want to get mucked around, and want a great product and service then get hold of these guys. We live in Army Bay Whangaparaoa and that distance did not affect the great service we enjoyed. Used their initiative and consulting skills in personalising our drop down curtain with our existing balustrade. Sparky was efficient and friendly as well. Ordered - drop down curtain and a canopy." "Cool Awnings recently made a custom canopy for an industrial application for us. They completed the job within a tight time frame in fact they exceeded expectation on delivery. They have also made other challenging industrial covers for us in the past and there work has always met our expectation. They are quick to grasp our ideas on what we are after and offer their own ideas and suggestions. I have found them professional to deal with and would recommend them." "Good initial first contact, followed up with very prompt service, delivery. Impressed that the team worked in with our hours, which meant a Saturday install, straight after their Company night out. Would be very happy to recommend, and would certainly use again." "I would happily recommend CoolAwings to anyone, great product, excellent service, good price and from telephone staff, salesperson and installers all were positive about the product, were very informative and helpful. A pleasure to deal with all round. " 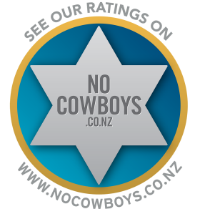 "I have put a post onto the No Cowboys website, in the affirmative, which is very accurate in reflecting the excellent way this project was completed. I can happily report that we now have staff who aren’t so badly affected by the direct heat through the skylights. The project has been a complete success, and I would like to convey my appreciation to Walter and the team for a job very well done." "Cool Awnings provide a fantastic professional service. The pricing is competitive and the staff are great to deal with and really know their stuff. They did a great job for more and turned it around quickly at a time of year which was particuarly busy. There products are great quality and look good. I would recommend them to anyone." When we needed an awning for our new home we approached Cool Awnings having been satisfied customers from at least 10 years ago. We were delighted to find the same high level of service, quality of product, competitive prices and extensive range of fabric. Amazingly, there was no extra charge for measurement and installation on Waiheke. We are very pleased with the result. When a much-loved historic building receives a new lease of life, it makes sense that the interior designers will match its traditional good looks with the spirit of today. After 70 years, Moa Hall on Waiheke Island has already enjoyed many lives. Most recently known as Moa Hall Art Gallery, the celebrated blue building has now been completely refreshed, says designer Shelley Brockliss of Yellowfox, the interior design firm that undertook the makeover. "The hall stands proud again, its historic charm balanced by the warmth and flavour of the ever-eclectic Waiheke lifestyle." Renamed Moa Business Studios, it now comprises three purpose-built studios that accommodate up to three professionals each. The spaces are designed with flair and offer an enviable work-life balance on the island. "Each studio features a large modern bathroom to shower or freshen up in after a swim, run or lunchtime walk," says Brockliss. "The studios are fitted with fully equipped kitchenettes and large decks for client entertaining. 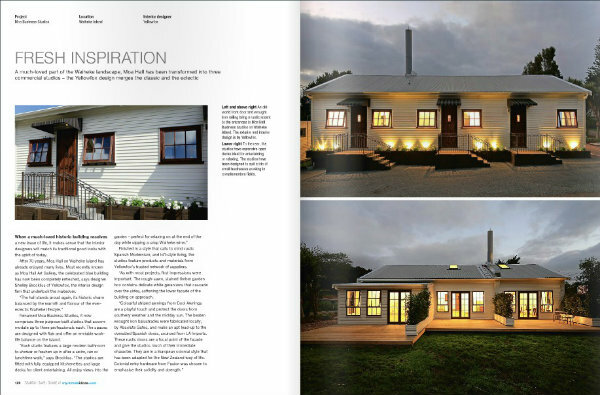 All enjoy views into the garden – perfect for relaxing on at the end of the day while sipping a crisp Waiheke wine." Finished in a style that calls to mind rustic Spanish Modernism, and loft-style living, the studios feature products and materials from Yellowfox's trusted network of suppliers. "As with most projects, first impressions were important. The rough-sawn, stained timber garden box contains delicate white geraniums that cascade over the sides, softening the lower facade of the building on approach. "Colourful striped awnings from Cool Awnings are a playful touch and protect the doors from southerly weather and the midday sun. How covering an exposed area kept kids playing even in the wind and rain. We have 23 kids and wanted to extend their outdoor play area. The problem we had though was that bad weather really limited the kids play space and we needed an outdoor area that could be used in both rain and sunshine. We contacted Cool Awnings who proposed to custom build a whole new room with a solid awning as the roof and retractable side drop curtains so we could adjust the panels depending on the weather. The new area has been great and has increased the children’s play area by about 20%. They get more space, it has a solid roof so doesn’t leak and allows the children to still get some fresh air when it’s raining. The kids love the new area. They have tables and chairs in there and love the fact that they get the outdoor feeling even when it’s raining. Having an enclosed area makes our job a lot easier with regards to supervising the kids too. Overall, we were really pleased with the service from Cool Awnings and the kids love being able to go outside all year round. Buyers want outdoor living. Whether it's a $500,000 starter home or a $7 million luxury pad, shaded outdoor living can help sell a property. Uncovered decks and patios that would have been a drawcard in the 1980s are no longer enough for modern Kiwis. . In 2016 companies such as Cool Awnings, Arch Gola, Total Cover, Fresco Shades and many others are doing a roaring trade selling retrofit canopies, shade sales, and outdoor blinds made of fire resistant PVC. That's because 21st century Kiwis value outdoor living, says Ken Davis of Herriot + Melhuish: Architecture. 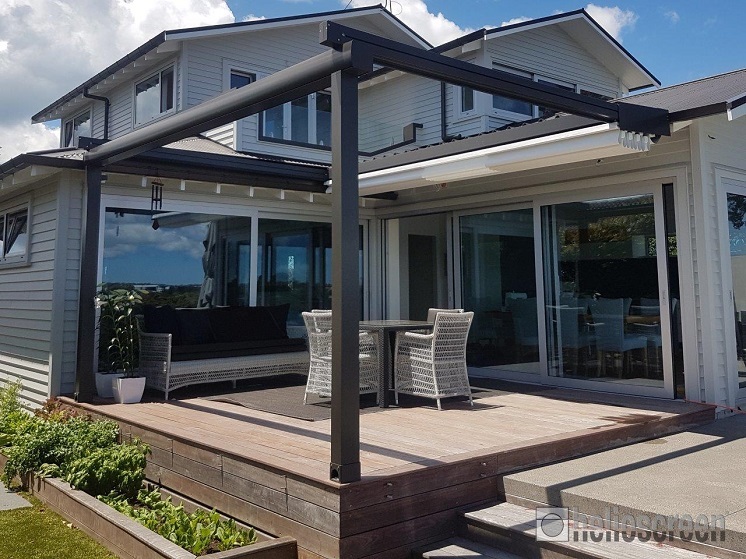 "Canopies can be very effective devices to provide shelter from Auckland's sun, rain and wind," says Davis. "Verandas and canopies can also enhance the appearance of a building. It is not just functional." Vendors worried about the lack of shade at their property can throw a few thousand dollars at the problem says Harcourts real estate agent Graham Viall. The investment will pay for itself, says Viall. Shade solutions vary hugely. If the home has no shade at all then a $30 shade cloth from Bunnings Warehouse creates some, says Davis. Or at the other end of the scale you can spend $30,000 and get a top-of-the range outdoor living area with a Louvretec spiral pivot opening roof system. "It's not like negative expenditure on a swimming pool." It's all a matter of what the home owner can afford. 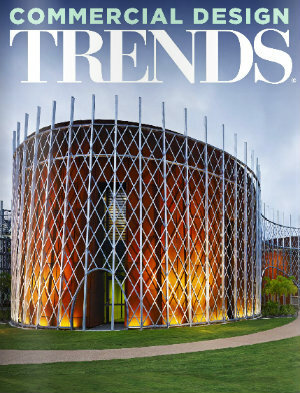 The latest innovation, says John Glenn of Cool Awnings is the Helioscreen fully retractable roof. These cost around $1000 a square metre. 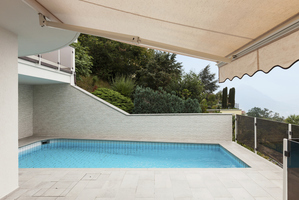 At a cheaper price point, but still a good solution for home shade and outdoor living are retractable awnings, which come in a variety of shapes, materials and colours, says Glenn. Awnings have moved on and buyers often choose motorised winch systems, which cost around $500. Some of these motorised systems can detect high wind conditions using a 3D motion sensor and automatically retract the awning. Motors can be retrofitted to lateral arm or, shadeline awnings as well as drop curtains, says Glenn. Fixed shade is also popular, he says. A flat panel or arched fixed awning costs from $450 a square metre including GST installed. It's very common for these to be made from 99 per cent UV resistant translucent architectural PVC. Beware, says Glenn, of buying cheap imports that may not have adequate UV protection or can't withstand harsh New Zealand conditions. Owners who plan to flick on the property probably don't worry too much about the finer details of their newly shaded area. If you want to live in the house, however, then it can be a good idea to get architectural input and look at systems for enclosing and heating the space in winter. Home owners installing large permanent shade solutions do need to check with their local council to see if they need building consent, says Glenn. Few need it, but they should always ask the question.